The morning that my kids went back to school, I started working on my list of all the things I wanted to get done over the summer. Y’all, I had such high hopes of all of the stuff we would get done around the house when it was too hot to play outside. Ha ha. Post-summer Lindsay is having a good chuckle at pre-summer Lindsay. 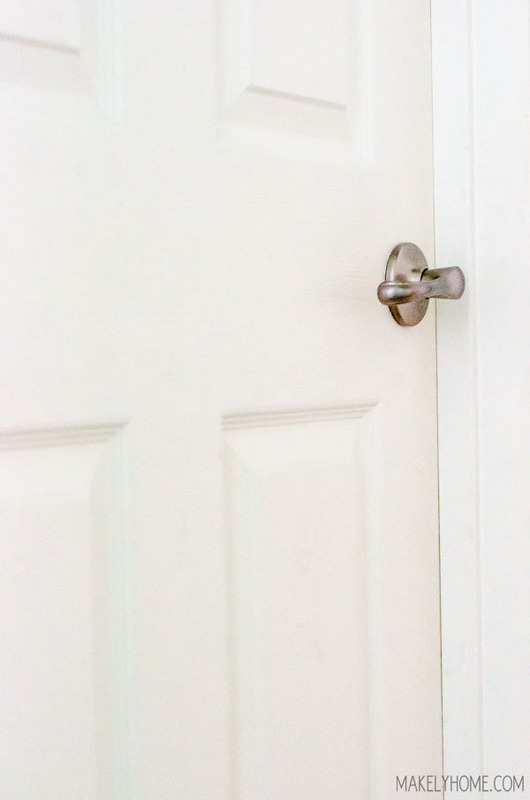 One of the things that I’ve been meaning to do for a long time is to remove the vinyl lettering on Zack’s bedroom door. When I applied it 5 years ago, it said Zack’s Room and had cute little cars on either side. Over the years, he peeled off the car detail and started picking at the letters. It ended up looking like this. I tried to remove the rest of the letters with just my fingernails, but the vinyl had aged and become brittle. Instead of it peeling up easily as new vinyl does, the old vinyl was coming off in tiny, chippy pieces. HomeRight sent me a Heat Deluxe II heat gun, and I figured it might be the perfect tool to remove these letters easily. My thought process was that if I could heat up the vinyl, it might become pliable again. Science-y, right? 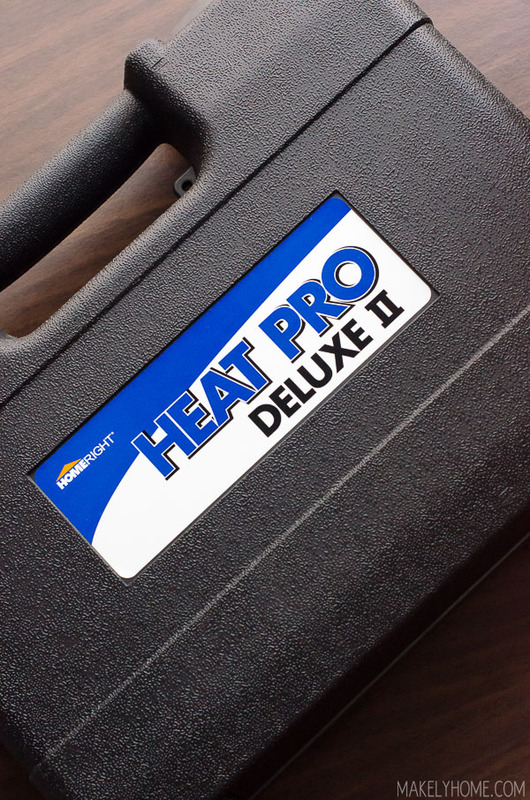 The heat gun comes in a hard sided case. As a side note, I want to point out that I wish EVERY tool came in a hard case. It makes it so easy to stack up tools on a garage shelf and helps to keep them free of sawdust. 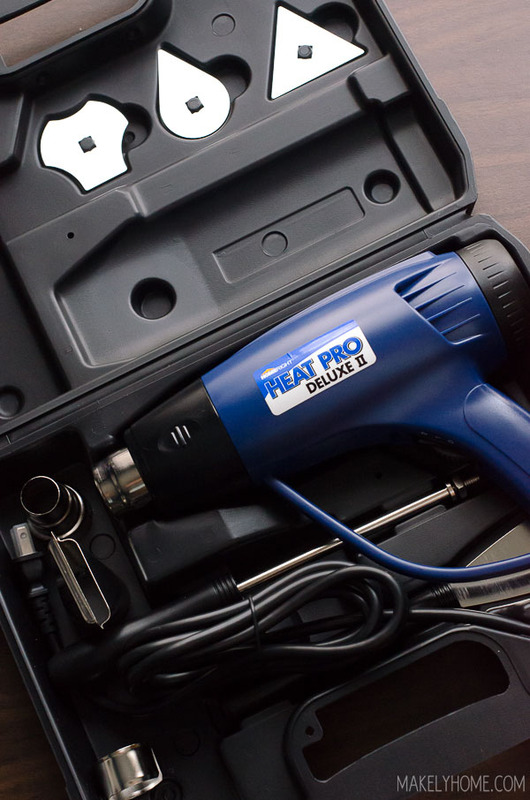 The Heat Pro Deluxe II heat gun (Amazon affiliate link) comes with tons of different attachments for different uses. There are different kinds of scrapers and nozzles so that you can strip paint, thaw frozen pipes, shrink-heat plastic or loosen rusted nuts and screws. I chose to use the heat gun in a low setting to warm up the vinyl. If I would have chosen high heat, the gun may have started to make the paint on the door bubble. Don’t worry – it has to be really hot to do that. I was really concerned that at heat gun would burn me the first time that I used one. But, on low, it’s definitely hotter than a hair dryer but it’s not burn-y hot. I added the director nozzle and aimed it right at the letters. I held the hot air on each letter for about 10 seconds. Then, I used the included metal scraper to get underneath the vinyl. Lo and behold, it peeled right off! Not every letter came off in one piece, but most of them did. The others split into two, but they were still much easier to get off than they were with no heat. Much better! I wish that I would have had this heat gun when I had to scrape the 30 stickers that he had stuck all over his door. That took me hours! Have you ever tried to remove really old vinyl lettering? Did it peel off easily, or did it become hard and brittle like mine did? This post has been sponsored by HomeRight. I was compensated for this post, but all opinions expressed are my own. First, I TOTALLY agree about hard cases for tools!!!!!! I’ve been wanting a heating gun for some crafty things but just couldn’t bring myself to really shop for one. Let me tell ya, the shopping is over! I’m sold!!! That table doesn’t stand a chance against me now!!!! I’m sooo glad I didn’t buy a cheapy little crafty heat gun with no case. Having a hard case, and seeing you use it, THIS is the tool I’m getting. Done deal. You had me at “thaw frozen pipes”. Story of my life. I’m gonna have to get me one of those! Can a regular hair dryer be used to remove? And what is another tool that can be used for peeling process?